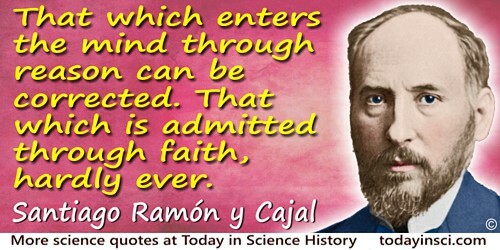 Spanish histologist who was awarded a Nobel Prize for his studies of the retina. 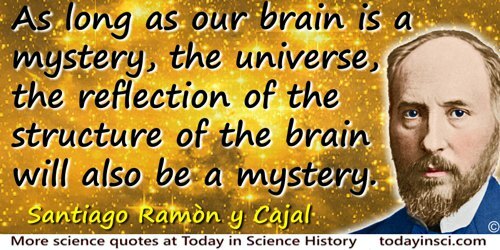 As long as our brain is a mystery, the universe, the reflection of the structure of the brain will also be a mystery. From Reglas y Consejos sobre Investigacíon Cientifica: Los tónicos de la voluntad. (1897), as translated by Neely and Larry W. Swanson, in Advice for a Young Investigator (1999), 39. 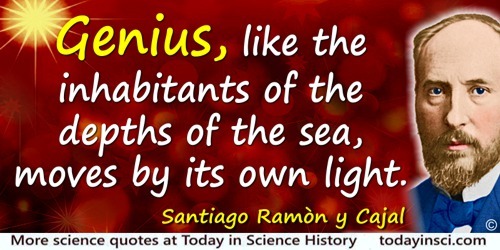 Genius, like the inhabitants of the depths of the sea, moves by its own light. If a photographic plate under the center of a lens focused on the heavens is exposed for hours, it comes to reveal stars so far away that even the most powerful telescopes fail to reveal them to the naked eye. 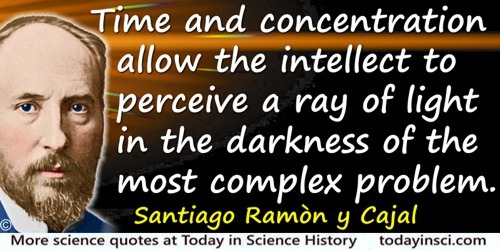 In a similar way, time and concentration allow the intellect to perceive a ray of light in the darkness of the most complex problem. From Reglas y Consejos sobre Investigacíon Cientifica: Los tónicos de la voluntad. (1897), as translated by Neely and Larry W. Swanson, in Advice for a Young Investigator (1999), 34. 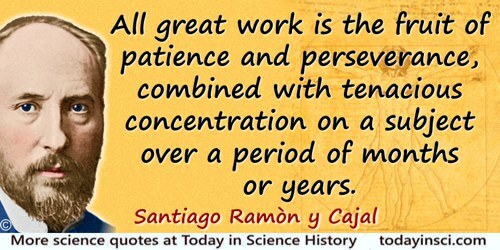 In summary, all great work is the fruit of patience and perseverance, combined with tenacious concentration on a subject over a period of months or years. From Reglas y Consejos sobre Investigacíon Cientifica: Los tónicos de la voluntad. (1897), as translated by Neely and Larry W. Swanson, in Advice for a Young Investigator (1999), 38. Intellectual beauty is sufficient unto itself, and only for it rather than for the future good of humanity does the scholar condemn himself to arduous and painful labors. From Reglas y Consejos sobre Investigacíon Cientifica: Los tónicos de la voluntad. (1897), as translated by Neely and Larry W. Swanson, in Advice for a Young Investigator (1999), 51. Intellectual work is an act of creation. It is as if the mental image that is studied over a period of time were to sprout appendages like an ameba—outgrowths that extend in all directions while avoiding one obstacle after another—before interdigitating with related ideas. 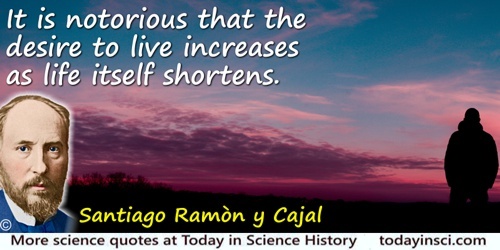 Like an earthquake, true senility announces itself by trembling and stammering. Nothing inspires more reverence and awe in me than an old man who knows how to change his mind. 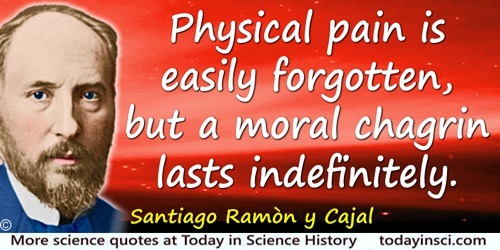 Physical pain is easily forgotten, but a moral chagrin lasts indefinitely. From Reglas y Consejos sobre Investigacíon Cientifica: Los tónicos de la voluntad. (1897), as translated by Neely and Larry W. Swanson, in Advice for a Young Investigator (1999), 17. To bring scientific investigation to a happy end once appropriate methods have been determined, we must hold firmly in mind the goal of the project. The object here is to focus the train of thought on more and more complex and accurate associations between images based on observation and ideas slumbering in the unconscious. From Reglas y Consejos sobre Investigacíon Cientifica: Los tónicos de la voluntad. (1897), as translated by Neely and Larry W. Swanson, in Advice for a Young Investigator (1999), 33. 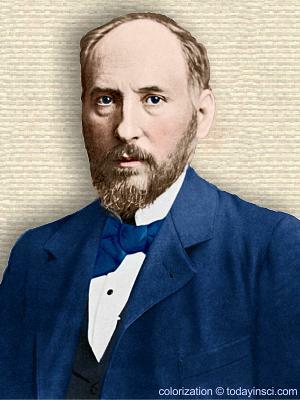 1 May - short biography, births, deaths and events on date of Cajal's birth.